Domaza is the fastest growing international property platform, translated in more than 20 languages and with more than 70 local sites on 6 continents (www.domaza.org). Domaza covers a wide range of target groups, which gives you the opportunity to aim at diverse international audience and build successful global partnerships. Our mission is to help all our clients buy, sell, rent or let their properties with minimum efforts, no matter where in the world they are. 1. Search for and advertise properties worldwide. 2. Improve the quality of services in property deals. For all clients searching for a property to buy or rent, Domaza provides quick and easy access to a comprehensive database that includes thousands of attractive property listings by leading agencies and construction companies worldwide. For all agencies, developers, investors and property owners, Domaza provides the best way to offer properties both locally and globally, through automatic upload of all their property listings in more than 20 languages. 1. Section “Properties” - targets private parties and legal entities promoting or searching for properties for sale or rent. 2. Section “Investment Projects” - targets investors and construction companies. 3. Section “Business” - targets entrepreneurs interested in starting a business or trading a running one. What does Domaza offer you? The international platform www.domaza.org has over 70 local sites. Each published property is visible automatically on all of them, with all relevant information simultaneously and professionally translated into more than 20 languages, providing the best way for our clients to promote their properties both locally and globally. With Domaza you can receive a free multilingual professional property website, such as: mysite.com, where you can advertise all your property listings and services. 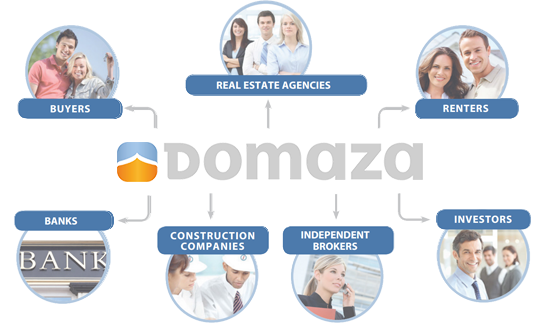 Thus, your properties will be seen by all visitors of your corporate site, as well as by all Domaza clients. If you sell apartments in a residential complex, we offer you a unique system that allows you to publish them under the same entry. You can add all necessary details for each apartment separately, such as: features, price, photos, PDF floor plans and mark which apartments are free, booked or already sold! The real estate agencies can take advantage of the option to create individual profiles for all their estate agents; hence they can use the system at the same time via separate accounts and manage their own property listings and clients. By various integrated multi-channel marketing campaigns, Domaza aims to promote your property offers, enhance your sales and expand your business globally. Start working with Domaza NOW!